A solitary crane takes in the last bit of sunlight as it dips below the horizon. Clamps hold together pieces of wood that will eventually make up the Workers’ Memorial monument. The cab of an out-of-service crane has seen better days. Metal rope runs from the bow of Enterprise (CVN 65) to a nearby pier holding the decommissioned ship steady. In the Pattern Shop, Apprentice Peter Watson cleans and preps a pattern prior to beginning work. Peering through a John F. Kennedy (CVN 79) unit located on the Final Assembly Platen, the sun sets slowly over the James River Bridge. Minerals are poured into the Foundry’s Argon Oxygen Decarburization (AOD) Furnace to create a particular type of steel. Shipbuilder Andra Pryear loads welding rods into a warmer, located in the Joint Manufacturing Assembly Facility’s Unit Outfitting Hall. A view from the top of “Big Blue,” looking down at John F. Kennedy (CVN 79) as Superlift 4159 is in progress. This lift occurred April 20, 2018, and signifies the 75 percent structurally complete milestone for the aircraft carrier. Shipbuilder Robert Green uses a milling machine on the face of a flange. The first of two ships carrying Newport News Shipbuilding's new 315-metric-ton Goliath gantry crane arrives at Dry Dock 12 March 20, 2018. 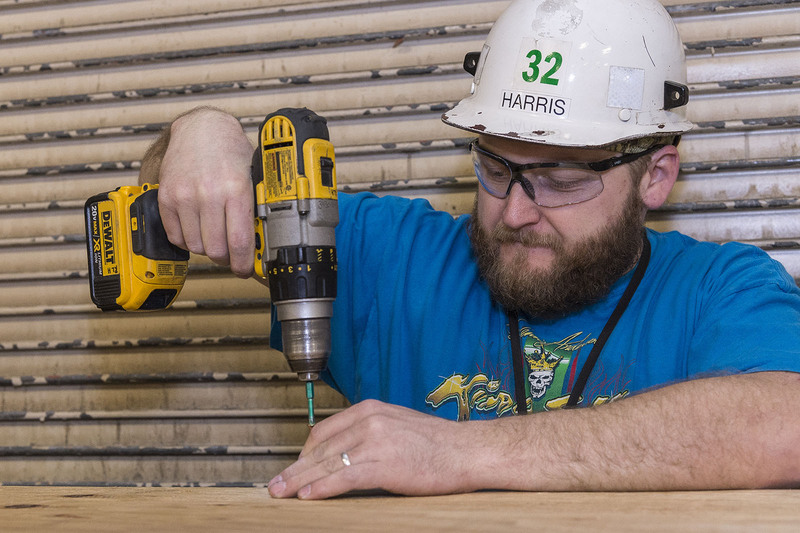 Shipbuilder Rodney Harris drills wood screws into a box that will be used to perform a test with insulation foam. To obtain draft readings, a johnboat maneuvers toward the hull of decommissioned Enterprise (CVN 65). 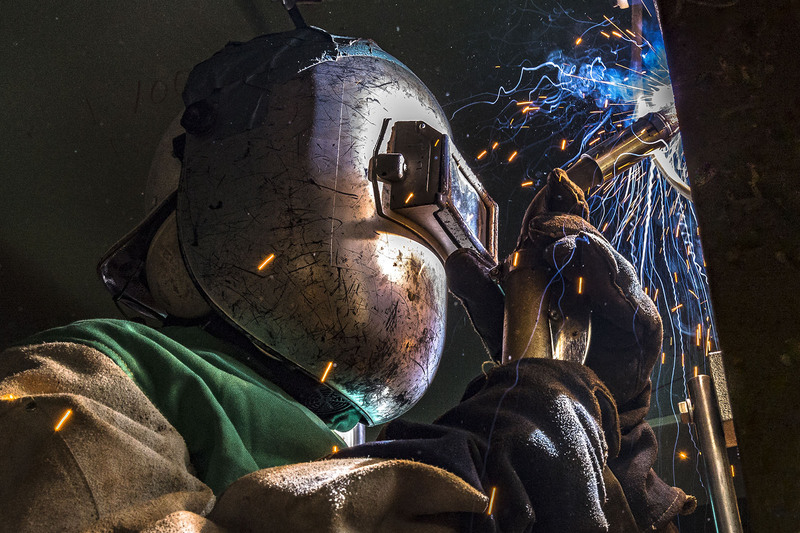 Sparks dance in front of the welding shield of David Boyd as he performs metal inert gas (MIG) welding on a John F. Kennedy (CVN 79) unit. A crane's distorted reflection is seen across the water in the South Yard. As spring settles in, pollen gathers in the James River near Pier 2. 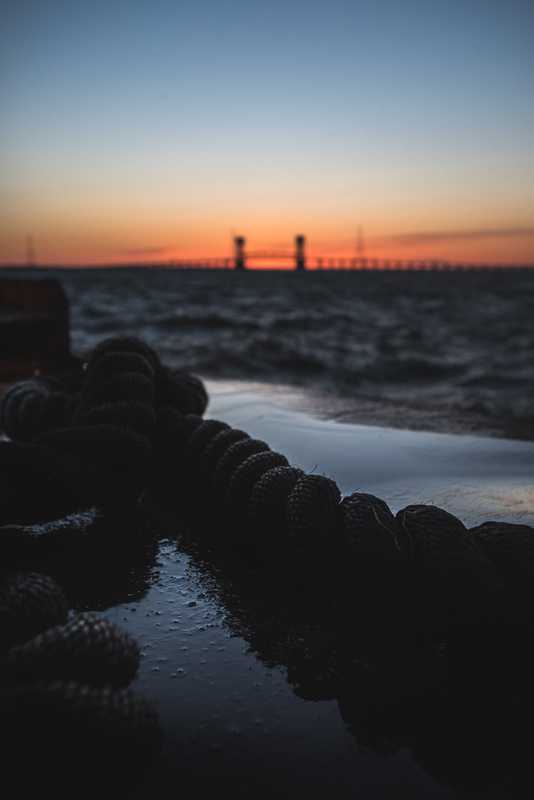 Rope is soaked by salty water from the James River along Newport News Shipbuilding's waterfront at dusk.